Landore's Miminiska Lake property, 100 per cent. 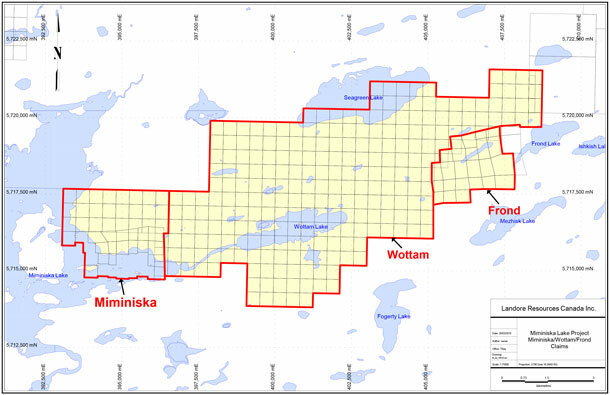 owned by Landore, covers an area of 5,494 hectares and is located approximately 130 kilometres to the north of the Junior Lake property and 115 kilometres to the east of the Pickle Lake mining camp in the highly productive and prospective Uchi Belt. Landore completed four drilling campaigns between 2003 and 2005 on the Miminiska gold occurrence with 47 NQ diamond drill holes for 9,349 metres, focusing on two potential shoots within a known 800 metres strike length. Excellent results were received with grades reporting up to 131 g/t gold over 0.5 metres and 40.2 g/t gold over 2.3 metres. For a total of 503,000 tonnes at 5.34 g/t for 86,357 ounces of gold. Both these exploration targets are open along strike and at depth and have good potential for expansion and upgrading to a mineral resource. 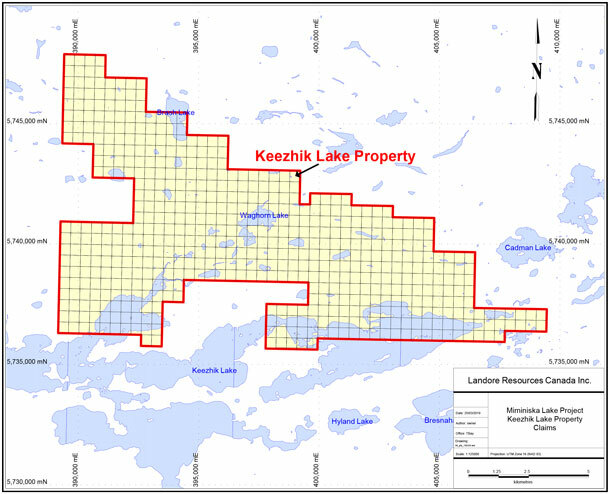 Landore holds 55 mining claim blocks, for 12,482 hectares, in the highly prospective Keezhik Lake area, located 20 kilometres north of Landore's Miminiska Lake property and 150 kilometres southeast of Goldcorp's Musselwhite Gold mine. During 2011, Landore consolidated its land package by staking 13 claim blocks, for 2,710 hectares, to encompass surrounding historic gold occurrences. As well, Landore purchased outright one claim from a third party, subject to a 2 per cent. net smelter return (NSR). Landore's land package now spans over 20 kilometres across prime gold exploration targets. The Keezhik Lake area is adjacent to the North-Caribou - Totogan Shear Zone that is also host to Goldcorp's Musselwhite Gold mine, located 150 kilometres to the northwest. The Musselwhite Gold mine has produced in excess of 2.5 million ounces with 2 million ounces of gold in mineral reserve. The Keezhik Lake claims are also located in the highly productive and prospective Uchi Belt. During Q3 2011, a field reconnaissance, mapping and sampling campaign was carried out at Keezhik Lake. Field investigation of geophysical anomalies, prospective geological features, and historical gold showings revealed several areas of interest on the property. Rock and soil sampling confirmed the existing gold occurrences, as well as identified new zones hosting lithologies prospective for gold mineralisation. Highlights of grab rock sampling include 19.82 g/t Au from a felsic outcrop and 2.03 g/t Au from a sheared melagabbro containing a one foot wide quartz vein.